Judea and Samaria is not occupied territory, therefore the EU ban on it should be lifted, legal experts tell Catherine Ashton. 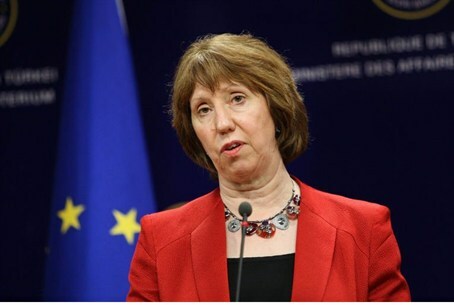 Hundreds of legal experts from Israel and around the world plan to appeal to European Union Foreign Affairs Commissioner Catherine Ashton and ask her to annul the EU's plan to impose financial sanctions on Israeli institutions operating beyond the 1949 Armistice Lines, the Israel Hayom daily newspaper reported on Sunday. On Friday, the European Commission ratified a resolution stating that the EU will no longer be party to any economic, social or academic ventures involving Israeli institutions based in Judea and Samaria, eastern Jerusalem or the Golan Heights. The appeal, which was declared on Saturday, is led by former Israeli Ambassador to Canada Alan Baker, who now serves as head of the International Action Division at the Legal Forum for the Land of Israel. Other signatories include former Justice Minister Yaakov Neeman and top jurists and international law experts Professor Eliav Shochetman and Professor Talia Einhorn, according to Israel Hayom. The appeal, which the signatories plan to send to Ashton in the coming days, urges the European Commission to rescind its directive, arguing it is "based on misguided and legally flawed assumptions about the status of the Israeli settlements and the validity of the 1967 lines as Israel's borders. "The EU's definition of Judea and Samaria as 'Palestinian territories' or 'occupied territories' is devoid of any legal or factual merit. The area was never defined as such [under international law] and therefore the EU's continuous use of this terminology undermines the negotiations for a permanent [peace] deal. … The EU's perception of the Israeli settlements' illegality stems from various different interpretations of international law," the signatories note. The Israeli lawyers further state that the EU's constant use of the term "1967 borders" is also devoid of legal merit, as the ceasefire agreement of 1949 between Israel and its Arab neighbors stipulates that the cease-fire lines cannot be construed as international borders. The appeal argues that UN Resolution 242, which bars the forceful annexation of land, and UN Resolution 338, which ratified the 1973 Yom Kippur War ceasefire, both mandate the negotiation of peace in the Middle East in a manner that would create "safe and secure borders for all states," as well as devise a just solution for all refugees, Jews and Arab alike. "I do not know whether our appeal can sway the European Commission's position on the matter, but Commissioner Ashton cannot simply dismiss the legal opinion of hundreds of international law experts," Baker said, according to Israel Hayom. "Our rights in these territories are very clear, as is the legitimate status of the settlements. This boycott is a regrettable step and it only stands to hurt the Palestinians and the world," Baker said. Baker is the former legal adviser of the Israeli Foreign Ministry and one of the authors of the Levy Report, which concluded that there is no “occupation” and international law allows Jews to live in Judea and Samaria, as its status was not that of a nation in 1967 when the areas were liberated by Israel. The report was presented to Prime Minister Binyamin Netanyahu last summer after months of study by former High Court Justice Edmund Levy, Baker, and a third legal expert. The conclusions of the report contradicted the view of the international community, strongly supported by the Obama administration in the United States, that a Jewish presence in Judea, Samaria and in united Jerusalem is illegal. Baker, however, rejected this and said that had Barak bothered to read the report, he would have found that its conclusions correct an injustice that has been going on for years.